September precipitation ranged from 50-100% of normal in parts of New York and northern New England (shaded orange) to more than 300% of normal in parts of Pennsylvania, West Virginia, and Maryland (shaded dark green). September was an extremely wet month for much of the Northeast. The wettest areas, which saw more than three times their normal September precipitation, were in West Virginia, Pennsylvania, and Maryland. 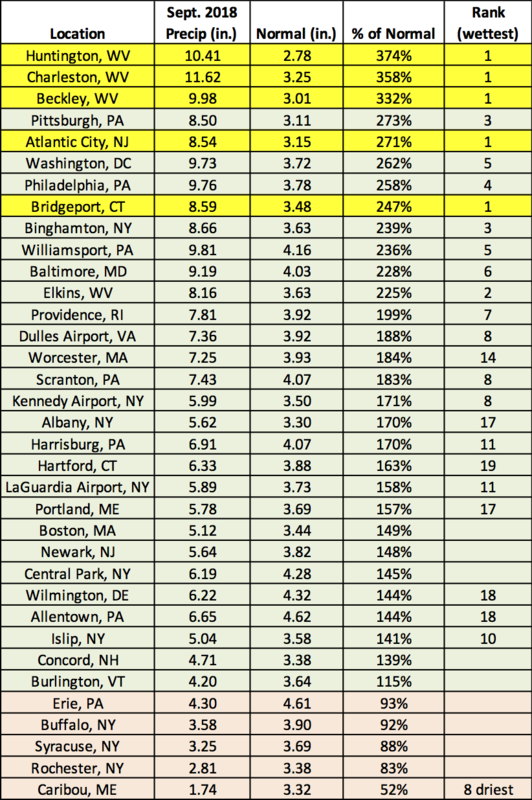 Five major climate sites had their wettest September on record - Huntington, Charleston, and Beckley, WV; Atlantic City, NJ; and Bridgeport, CT. Another 20 (of the 35) major climates sites ranked this September among their 20 wettest on record. 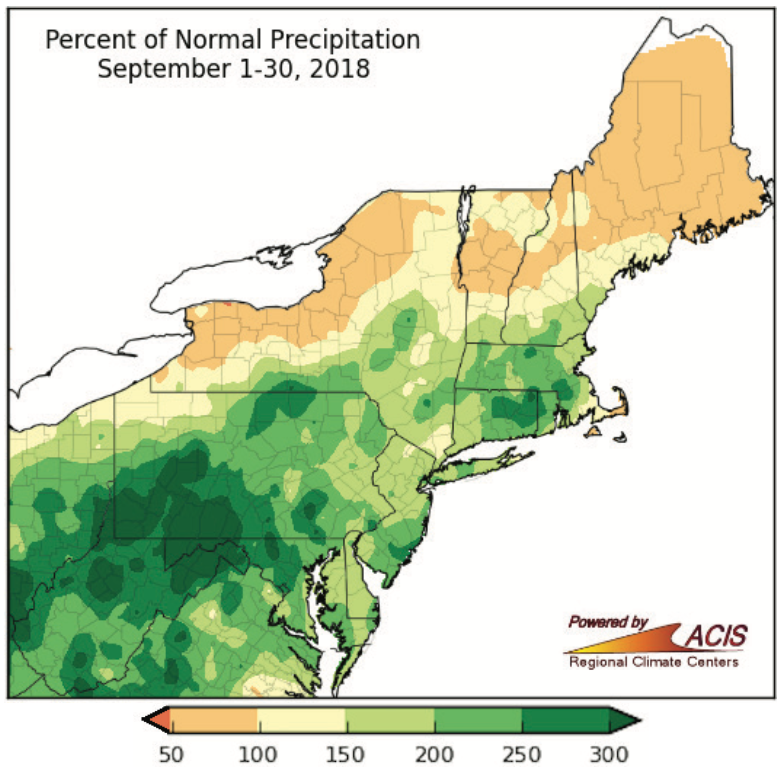 There were, however, some areas that didn’t receive a typical September’s worth of rainfall, including portions of northern New England and northern and western New York. For instance, Caribou, ME, had its eighth driest September on record. Drought and abnormally dry conditions continued to affect these areas. Twelve major climate sites saw more than double their normal September precipitation, with five of those sites having a record wet September (highlighted yellow). Average temperatures for September were up to 8°F above normal. 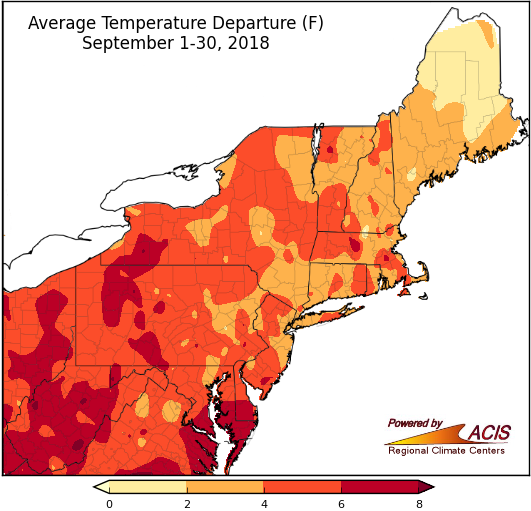 September was quite warm for the entire Northeast, with temperatures up to 8°F above normal. 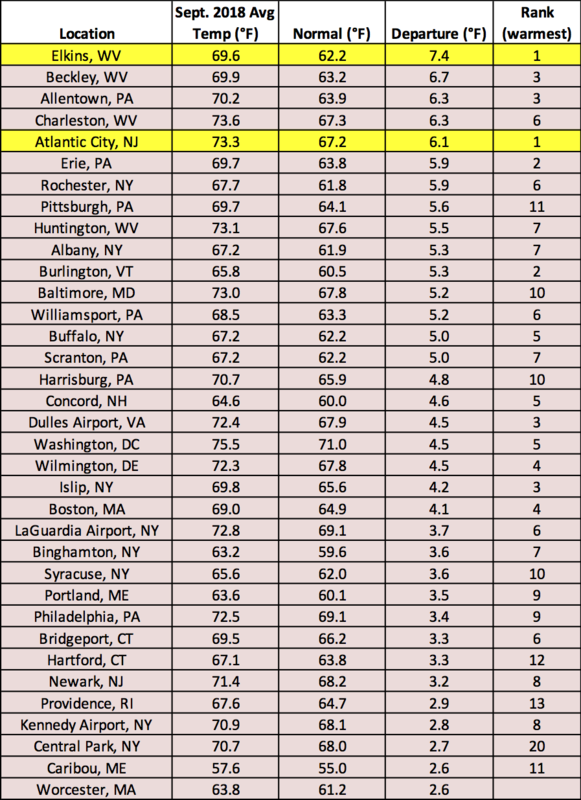 Elkins, WV and Atlantic City, NJ, had their hottest Septembers on record. In all, 34 of the 35 major climate sites ranked this September among their 20 warmest on record. Two major climate sites were record warm in September, with all the rest seeing above-normal temperatures, as well. The warmer-than-normal temperatures are expected to stick around for October, according to NOAA’s Climate Prediction Center. 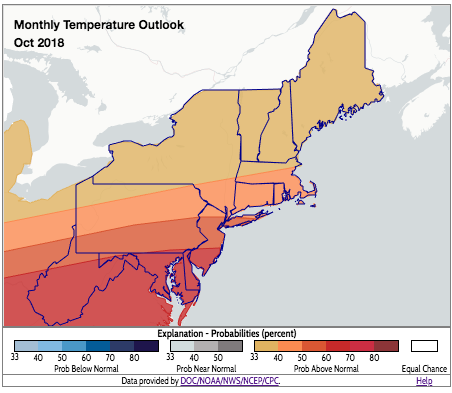 The October temperature outlook indicates increased chances of above-normal temperatures for the entire Northeast, with the greatest likelihood in southern New Jersey, Delaware, almost all of Maryland, and much of West Virginia. The Climate Prediction Center’s temperature outlook for October, which indicates above-normal temperatures are favored. 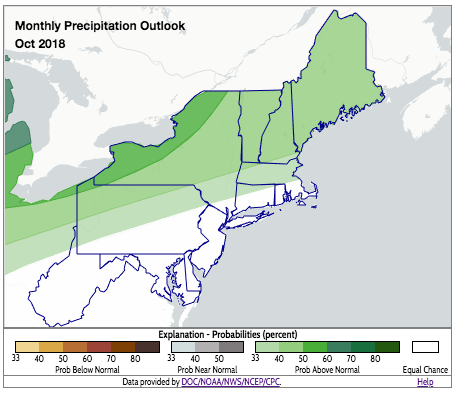 As for precipitation, the Climate Prediction Center’s outlook favors wetter-than-normal conditions for an area stretching from the Northern Panhandle of West Virginia through northern and western Pennsylvania across much of New York and into northern and central New England. Elsewhere, equal chances of below-, near-, or above-normal precipitation is forecast. For October, above-normal precipitation is favored in areas shaded green, while equal chances are forecast for areas shaded white.